SHa Noi - Lao Cai railway route through Yen Bai province from Km 144 + 750 to Km 230 + 000 with the length of 85.25 km, there are 10 stations, passing through 20 communes and wards. 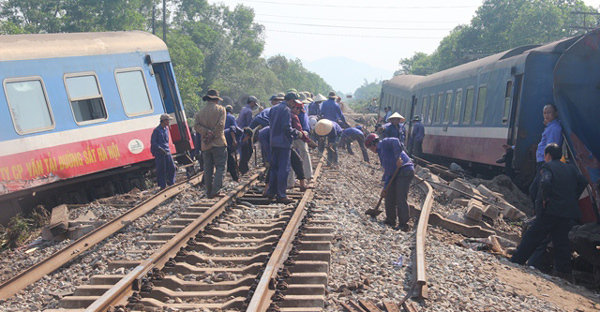 "Most of the railway accidents happened in the past time due to lack of attention by traffic participants as many of the accidents occurred at the intersections of roads and railroads which have been marked as "Attention to the train" said Tran Xuan Quyet, chief of the traffic police office in Yen Bai province. From 2016, the People's Committee of Yen Bai province and the provincial Department of Transportation have directed the localities to strengthen the work of ensuring the quality of traffic at roads and railways; Request the People's Committees of districts, towns and cities to mobilize resources from localities and people to carry out the construction of the deceleration ramp, organize the guards at the crossroads, roads with the railway. "So far, nothing has been done due to lack of funding. In the coming time, to promote railway traffic safety in the area, the Provincial Traffic Safety Board will promote the propaganda of the Railways Law to all classes of people. At the same time, it is expected that the Government, ministries and agencies to provide funding for the construction of a road to remove dangerous intersections; renovation of road surface, construction of speed reducer, signage and automatic warning system in dangerous locations, "he added..